Standard Portable Highbanker Trommel - FREE SHIPPING! 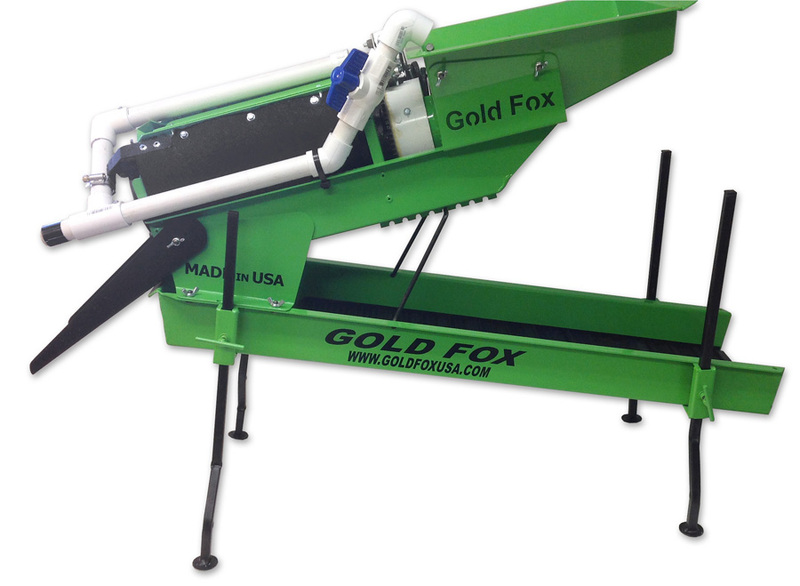 Looking for a versatile gold mining machine— classifier, highbanker, trommel— that will get the gold? Want one light-weight machine that will do it all? Check this out! Use as a highbanker or switch out the top box in minutes and install the 5 inch trommel. The bottom sluice box is 36'' x 8'' x 3'' and includes light weight leg attachments with four corner adjustments. Inside the sluice are 5 different Gold Hog brand mats in this order: UR, Scrubber, Razor, Down Draft, and Bedrock. Scroll to bottom for a description of each type of mat. Total weight is just 28 pounds so it is very portable— take it just about anywhere! This is a complete unit that is ready to run on your battery. Choose your color from drop down menu below: black, lime green, red, forest green, or blue. The Gold Hog Under Riffle Mat is a multi-function "active" mat that constantly exchanges materials for heavier ones. It performs the best with water flows over 1,000 gph and is desgined to be an under riffle, under expanded metal sluicebox mat. It is made from extruded EPDM rubber and is heavy, durable, and this patent pending mat is able to withstand commercial sluice boxes in all temperatures. The Gold Hog Low Turbulence Scrubber Mat (a.k.a. the Wild Boar) is designed to help break up clay and dirt, releasing gold and heavy metals. This patent-pending mat is made from extruded EPDM rubber and is heavy, durable, and able to withstand commercial sluice boxes in all temperatures. The Gold Hog Medium Velocity Mat (a.k.a. the Razorback) is designed to work in a wider range of sluices, including stream sluices. It uses Micro Riffles to create low turbulent vortexes that do not throw fine gold back into faster moving upper currents. The River Hog Mat (down draft) is designed for dredges and commercial operations, although it also works great in a wide variety of equipment such as a mini highbanker. This mat has a very aggressive face pattern that uses a large riffle to cause traditional flow interruption vortexes. The drop chambers and the pre-ramp grooves catch gold even before it hits the riffle. Varying surfaces such as this is the key to great gold recovery! The Bedrock Mat was new for 2013 and is a hybrid mat designed for higher water speeds, and has the ability to separate out even super fine gold down to -200 mesh material. Not recommended for slow water stream sluices because there is just not enough "energy" to get the proper exchange flowing. This mat should be used in addition with other Gold Hog brand mats.